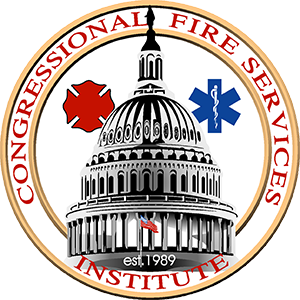 Bill Webb has served as Executive Director of the Congressional Fire Services Institute (CFSI) since 1995. In his capacity as Executive Director, Bill works closely with members of Congress and fire service leaders on developing federal legislation and enhancing federal programs designed to improve the readiness of our nation’s fire and emergency services. A writer and speaker, Bill has traveled throughout the country speaking at major conferences and trade shows. His written work has covered a broad range of first responder issues and has been featured in major fire service publications. In addition, he has served on a number of panels and testified before commissions and panels including the Advisory Panel to Assess Domestic Response Capabilities for Terrorism Involving Weapons of Mass Destruction. Before joining CFSI, Bill worked for the Firefighter Combat Challenge as the project manager for the competition. A former member of the first Bush administration, he served as a special assistant to cabinet secretaries at the U.S. Departments of Education and Labor, preparing briefings and accompanying the secretaries as a personal travel aide. Bill is an honorary member of the Vienna, Virginia Volunteer Fire Department, the Delaware Volunteer Firemen’s Association, and the International Association of Fire Fighter’ Local 36. He also serves on the National Fallen Firefighters Foundation Board of Directors. He and his wife, Katie, reside in Vienna, Virginia with their three children. Sean Carroll is the Director of Government Affairs for the Congressional Fire Services Institute (CFSI), a position he has held since joining the Institute in 2002. As the Director of Government Affairs, Sean is responsible for tracking all federal legislation and programs relating to the fire and emergency services, maintaining communications with members of Congress and federal officials, and designing educational programs targeting Capitol Hill and the White House. Sean also coordinates the activities of CFSI’s National Advisory Committee, a coalition of over 40 national fire and emergency services organization. Before joining CFSI, Sean worked for United States Senator Susan M. Collins (R-ME) as her Director of Constituent Services. A native of Gray, Maine, Sean received his B.A. in Political Science from the University of Maine in 1998. Steven Tramel is the Development Manager for the Congressional Fire Services Institute (CFSI). His primary responsibility is to manage all fundraising programs, including the annual National Fire and Emergency Services Symposium and Dinner Program, while performing office administrative duties. A native of Florida, Steven earned a B.A.S Degree in Organizational Management of Public Safety from Indian River State College and his M.P.A from Bellevue University. During that time he worked as a representative for a property management company. Before joining CFSI, he served as an intern in the offices of House Minority Whip Steny Hoyer and Congresswoman Terri Sewell (AL-07).